We can guarantee fast delivery times and offer multilingual customer support. 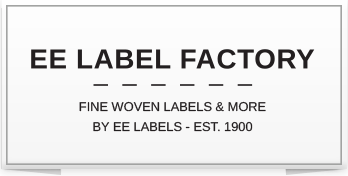 EE Label Factory is our online B2B store and part of primary label supplier EE Labels. All of our labels are manufactured at our factory in Heeze, Eindhoven Brainport Region. EE Labels is the first Dutch company to obtain the sustainable textile production (STeP) certification. EE Label Factory is your online stop for easily designing and ordering your own labels, in any quantity from 500 to 4.000 labels. The label of your garment or other product forms an essential part of your marketing strategy. Designing a label is often left to the last minute so we know that speed, quality, and efficiency are crucial. That's why we guarantee you'll have your labels within 7 working days plus shipping! Great collaboration, communication, and quality. Soft labels, just like we wanted. EE Labels is always ready to think along with you to find a wonderful but affordable solution. We love working with EE Labels. Good quality, great customer service, and fast delivery! koda amsterdam works with Dutch designers, Dutch ateliers and everything is produced in The Netherlands. Starting from the very first moment in 2013 we closely work together with EE Labels; it has been a pleasure. Key words for this collaboration: creative, innovative, professional, good service and mainly the personal contact we've had makes it a pleasant cooperation.